Design As a Franchise-able Commodity? or, Is a Logo Worth More Than an Inkjet Printer? 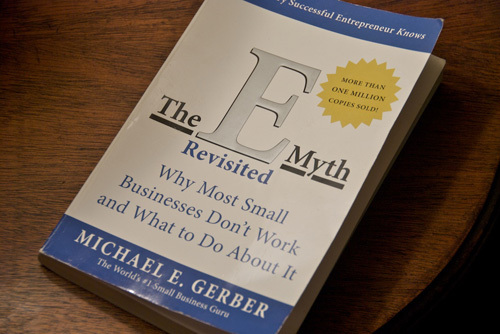 I recently had a book recommended to me by a friend that has evidently been must-reading for entrepreneurs for years called, The E-Myth Revisited, by Michael E. Gerber. I was aware of the book, but it had never been on my reading list. After my friend flat-out told me that, “You have to read this book” while simultaneously thrusting his well-worn copy into my hands I decided to take him up on his exhortation. While it has more of a Zen influence then I would like, I still found myself quite captivated with all of the business possibilities it stirred up in my mind (and heart). While there were many insightful sections that have stirred me to re-evaluate my own business model, I found myself in a bit of a frustrating quandary. For those who haven’t read the book, I won’t spoil too much (other than they all die in the end) by revealing that much of the business model is based upon developing a franchise-able vision for your company. My quandary was that I could not reconcile my appreciation for the franchise model which relies on developing systems that deliver quantifiable and repeatable, consistent results, with the reality of my business which at its very essence relies on uniqueness, abstract thought, subjective opinion and thinking “outside the box” as it were. How could a design business be modeled as a business that could be franchised?